More Unterwegs for July: U-Bahn affection. These British tourists had been discussing the Berlin transit system. The husband was very grateful to his wife for explaining the finer points of stamping your ticket. She was like, sure honey, don’t worry, you’ll be fine. My little Unterwegs drawings are becoming detailed mixed-media and pastel paintings, to my astonishment! This entry was posted in Baking, My art and tagged art in berlin, Berlin, Berlin drawing, drawing, drawing in berlin, life drawing Berlin., live drawing, portrait drawing, portraiture, Suzanne Forbes, Suzanne Forbes art, Suzanne Forbes artist on July 30, 2017 by Suzanne Forbes. Halloween 2016 recap – our first Halloween party in Berlin! 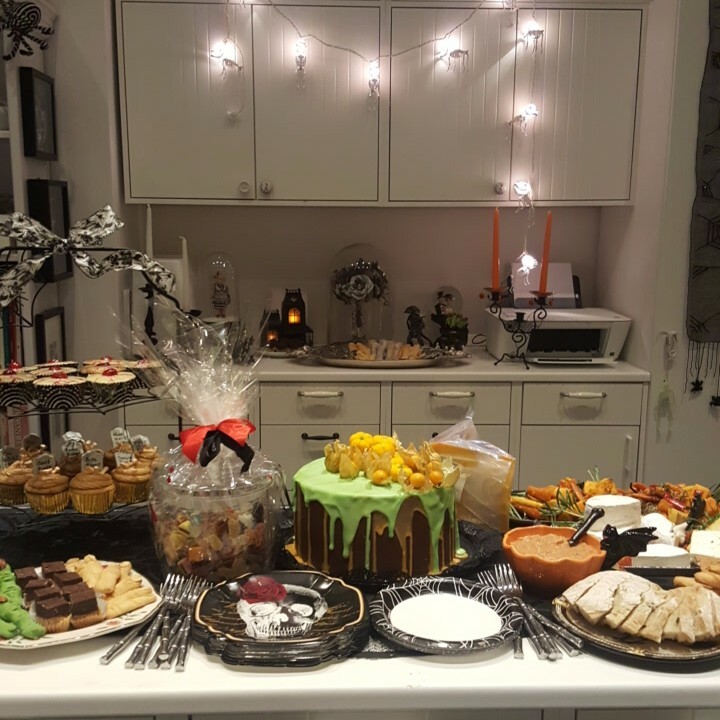 Designing, planning and cooking for Halloween parties is one of my deepest creative passions. I made a bunch of vegan and gf desserts for the first time this year. Some of them were good! I learned the white chocolate drip glaze technique to make the glazes for my beloved brother and sister in law’s wedding cake; you can see it here! I started my craft projects in September, and my baking October 1. I am bugfuck crazy about Halloween. So even though I’m still reeling with horror about the US election, I’m going to post some pictures of the creative things I did for my favorite holiday. 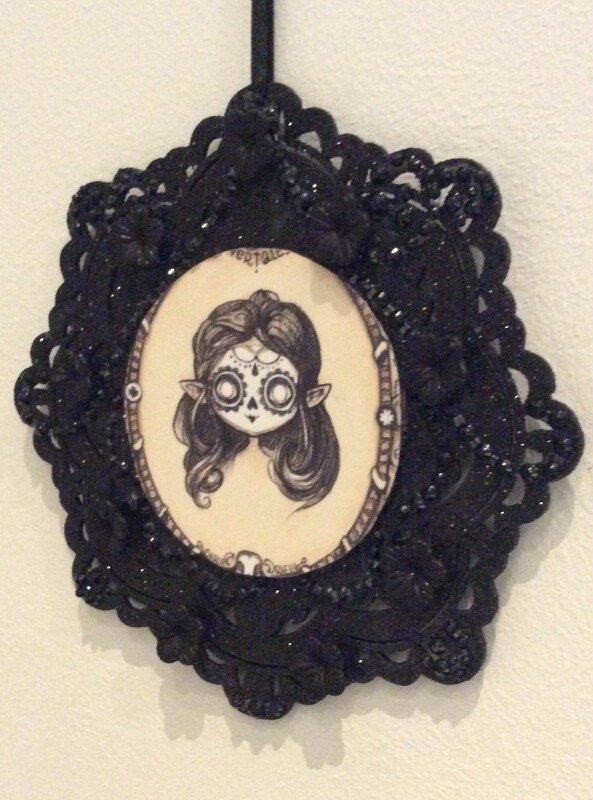 Seeing other people make beautiful things and follow their passions has been sustaining to me. I hope seeing my weird stuff feels good to you. 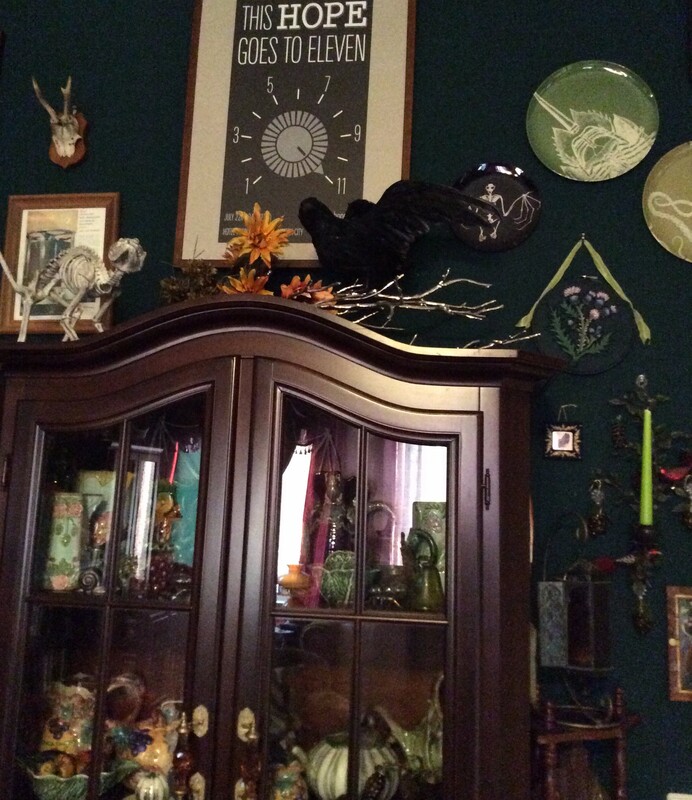 I decorated the house. 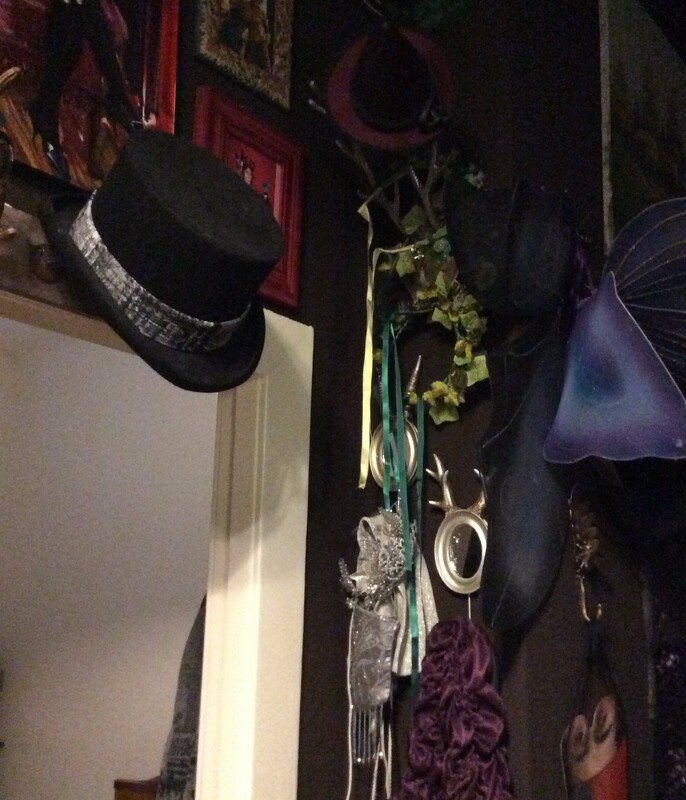 I can no longer tell what I put up for Halloween and what was already there. 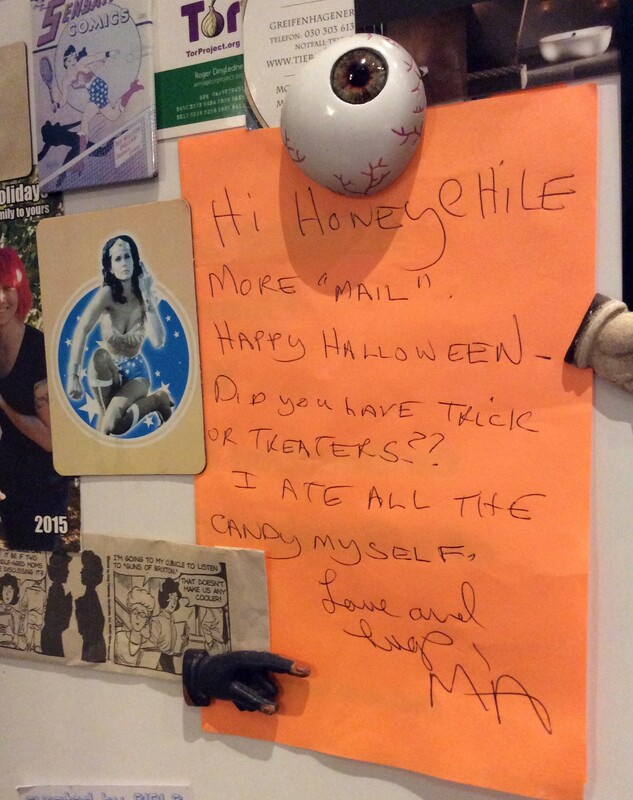 Like this note from my mom from last Halloween, which is basically just part of our kitchen now. 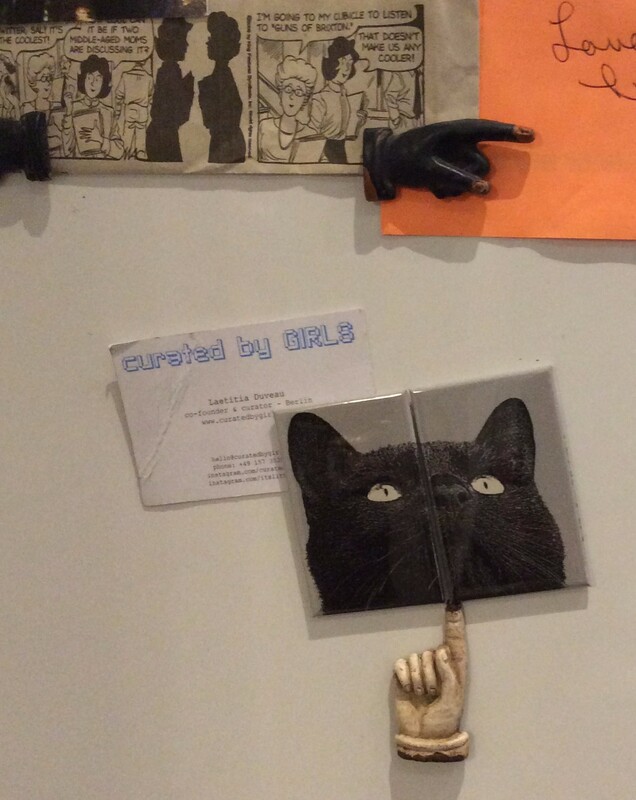 And these magnets Daria got me on one of her trips. 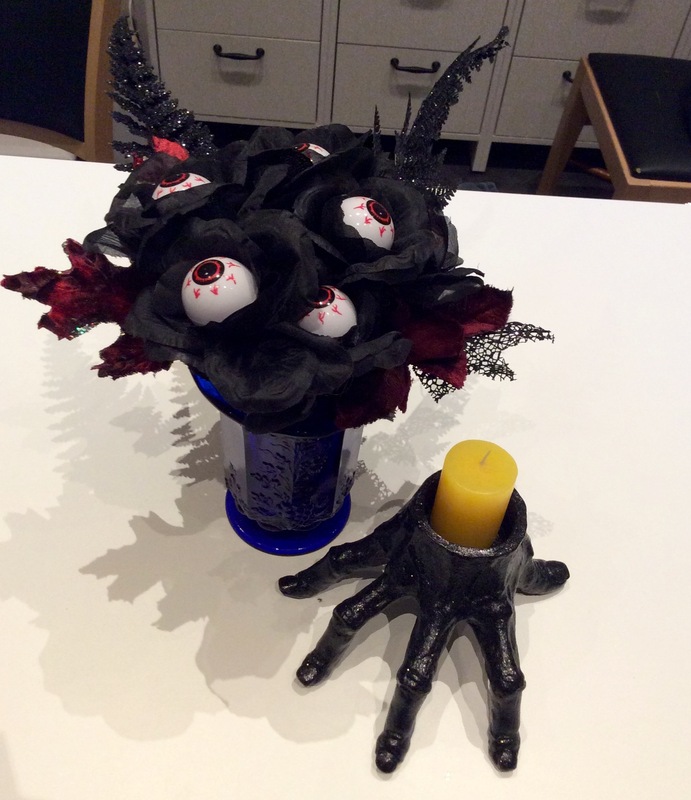 I don’t even know where this other eyeball bouquet I made and the creepy hand are in the house now. So it’s not like I could put them away. I guess it’s all staying up! Santa hats for all the bats! 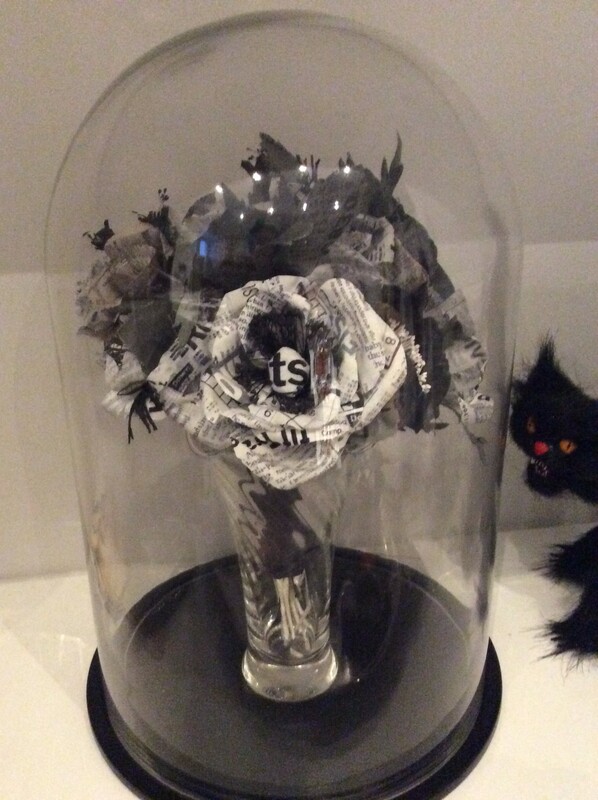 I finally found a glass dome big enough for my bridal bouquet of paper and fabric flowers made by amazing artists Anandamayi Arnold and Aimee Baldwin. All I had to do was sand and paint the base, which was some hideous pale oak color, black. This work of art made by beloved friends displayed in our home was one of the visions I held onto tightly during our whole move and housing search. Creating a safe space to honor the works made by the cherished creative people I have known and loved is a huge part of who I am and how I am motivated. Holding onto so many precious, delicate, completely unique things is a lot of work and a lot of stress. I used a lot of acid-free tissue and bubble wrap to get them here. But without weird object-attachment people like me, there’d be no museums! 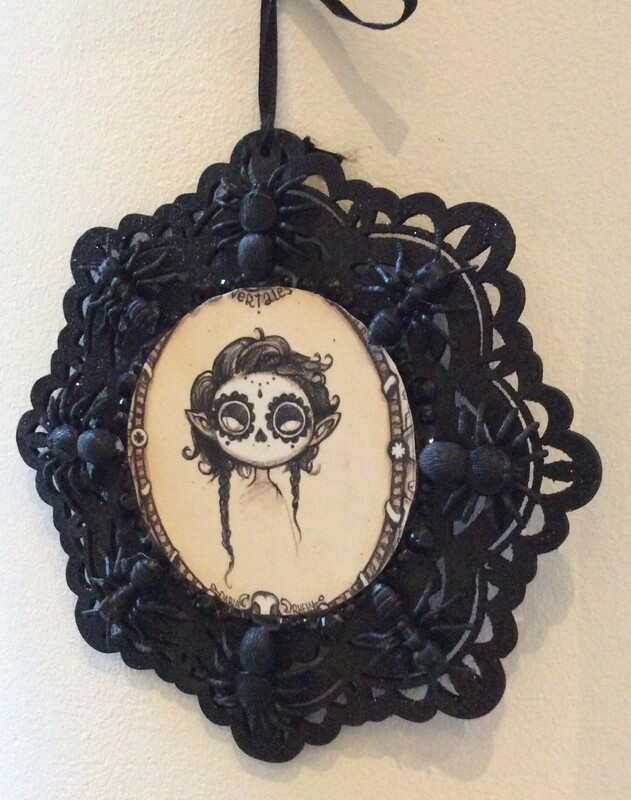 I made this hideous dolly kind of in my spare time in parallel to my Gothic Burlesque Elsa Lanchester Bride of Frankenstein. Isn’t she lovely? Not so much? Oh come on, you like her right? 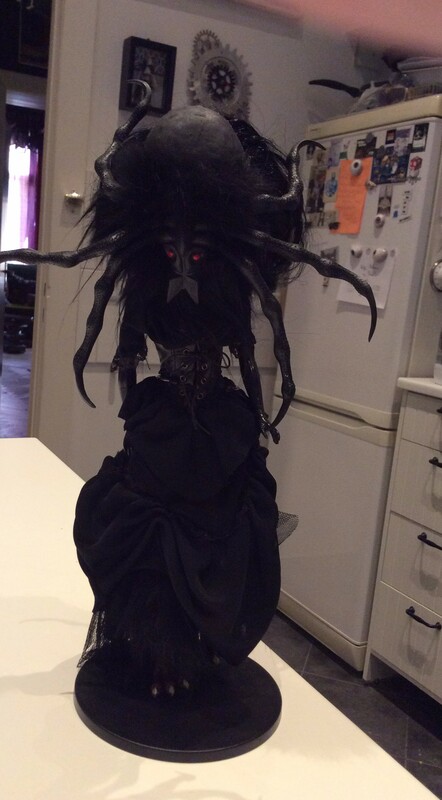 Well, she came out exactly as I saw her in my head, and it’s a rare project you can say that about, especially one involving a rubber spider, hair ties, epoxy clay and faux fur. Fun fact: the boots I used for Elsa were the boots that were on the feet of this Living Dead doll before I, um, cut them off with a hacksaw. 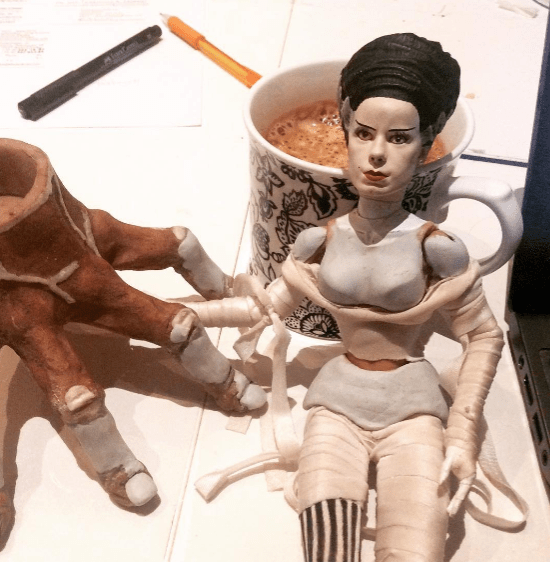 I packed them with epoxy clay to give my Bride more weight and structural stability at her base. And I also used epoxy clay to make a dollar-store zombie hand candleholder more normal. You know, I just wanted a regular creepy disembodied hand. I wish it was still the week before Halloween, before the darkness and terror of November 8. I wish I wasn’t so afraid for the US and the world. I wish I could go back in time to when I bought this poster, when it seemed impossible such a creature could win the election. I hope and pray by next Halloween the world will be less insane. I thank you and love you for all that you do. 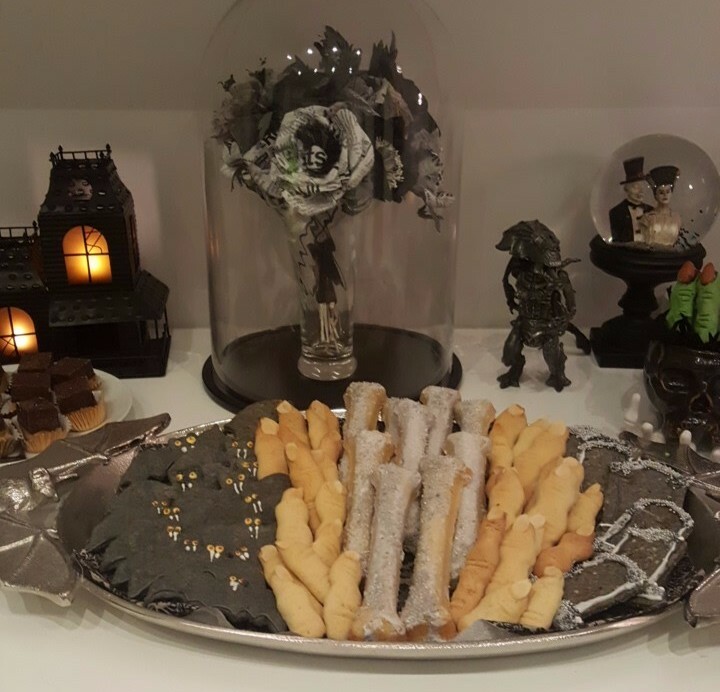 This entry was posted in Baking, Berlin, My art and tagged "Glücklich in Berlin", art in berlin, bricolage, contemporary crafts, DIY, DIY Halloween, goth halloween party, gothic halloween, gothic Halloween party, gothic rococo, gothoween, Halloween, Halloween 2016, Halloween in Berlin, Halloween party, mixed media sculpture, OOAK doll, Suzanne Forbes, Suzanne Forbes artist on November 24, 2016 by Suzanne Forbes. 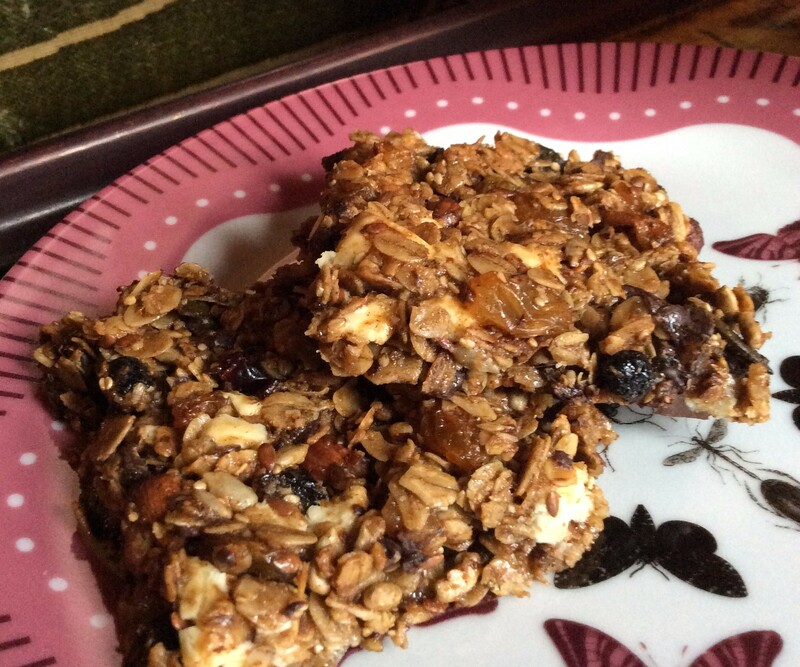 Five-Car Fender-Bender Fruit and Nut Flapjacks, which are gluten free. 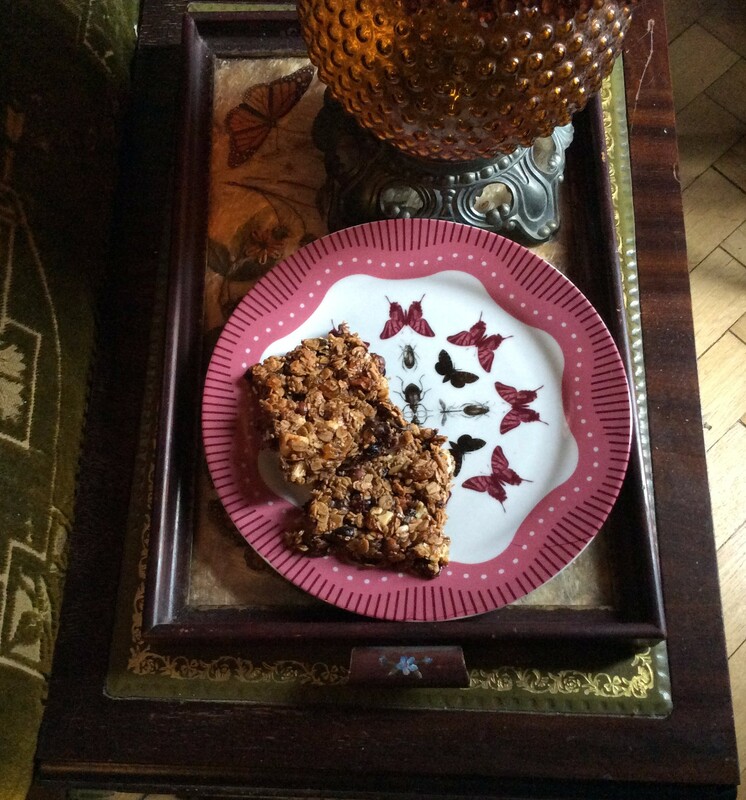 I was introduced to British flapjacks years ago when staying with one of my friend/muse/patrons in London. He said they were pretty easy to make, and the ones he made were definitely delicious. There are lots of good German bakeries in our neighborhood (six in a one-block radius), a very good French bakery downstairs, but no American or British style bakeries for miles. So I thought I would make some flapjacks. In my perfect world, desserts consist of butter, sugar, chocolate and cream binding nuts, whole grains, seeds and fruit. This is what happens when a libertine grows up surrounded by hippies. I took the most popular, ultra-easy flapjack recipe from BBC Good Food and adapted it, guided by feedback from other bakers in the comments as always. This was the first recipe I made using a scale, weighing ingredients instead of measuring them. Now, the best American baking book authors have for decades inveighed against measuring and urged American cooks to switch to the European method of weighing ingredients. But I think very little has shifted. (Not surprised; after all, I was in grade school at the time of the Metric Conversion Act, and saw it fail). I’ve worked in a lot of commercial kitchens, yet none of them had made the switch. The pastry chefs who contribute recipes to fancy books and magazines with weights instead of measures are working in the very top-level patisseries and restaurants. There are meaningful advantages to weighing for bakers. For one, you can get an exact quantity of flour without the whole “sift and then measure?” “Scoop and level?” drama. And you can weigh amounts of lumpy irregular things like chopped nuts more accurately. I would encourage anyone who has a digital kitchen scale to try weighing ingredients. Until then… below, my recipe for flapjacks for the US baker. 1 stick of butter, the best you can find- I use Kerrygold Irish butter, and the higher butterfat of European style butter makes a huge difference. I use salted, but you can go either way. 1/2 cup dark brown sugar, the best you can get- I use Billington’s Unrefined Dark Muscovado. 3 Tablespoons of Lyle’s Golden Syrup, or dark corn syrup. 1/4 cup hazelnut or almond meal and one egg. Up to 2 full cups of your choice of mix-in goodies: I used about 1/4 cup each of chopped dark chocolate (since chocolate chips aren’t available here), white chocolate, hazelnuts, golden raisins, dried superfruit mix with cranberries, blueberries etc., sliced almonds, candied orange peel, and this delicious “Basic seed mix”* you can buy at the grocery store here. Butter your pan(s), then line with parchment and butter the parchment. Set aside. Put the sugar, butter and syrup in your microwavable container and nuke for a couple minutes, keeping an eye on it. You want the butter to not be fully melted when you pull it out. Stir thoroughly, until mixture is well mixed. If you’re adding vanilla, sea salt, orange oil and/or salt, stir them in now. Set aside. Put the oats in your bowl. Pour the sugar/butter mix over and stir in thoroughly, making sure the oats are completely wet. If you’re using the nut meal and egg, crack the egg into your gooey unwashed microwavable container, add the nut meal, stir well, and scrape into to the oat mix. Then go nuts adding your mix-in treats! The mixture will be chunky and gloppy. Press it into your lined pan or pans, using your hand or the back of a wet spoon to compress the mixture and get it nicely level. Use the back side of the knife to lightly score the leveled mixture into bars of your desired size- you don’t have to drag the knife all the way to the bottom of the pan, just make indents. Bake for at least fifteen minutes. 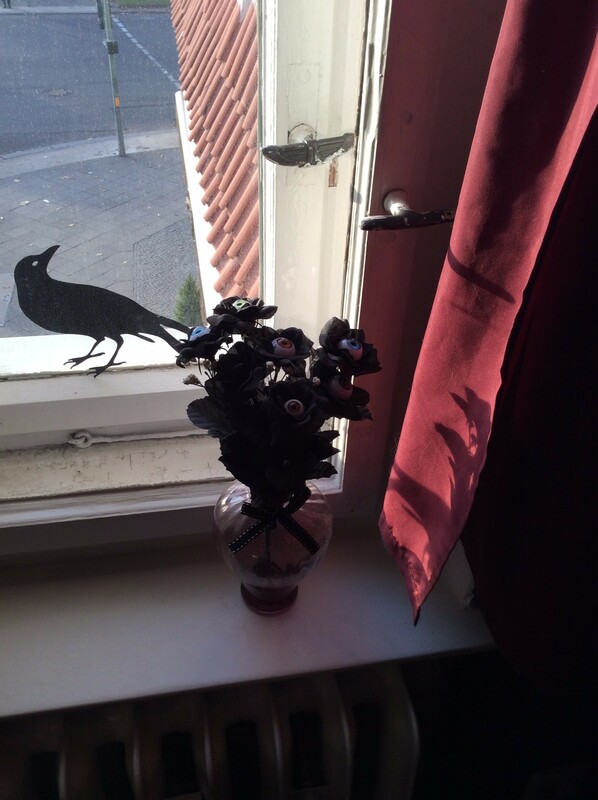 The amount of time is HIGHLY variable, but here is the secret: when you smell it, check it. I learned this from a chef years ago and it has governed my baking, nut toasting and pizza baking ever since. There is a turning point in oven baking where ingredients volatilize, and that means your baked item is almost done. Flapjacks are done when they’re not burned; how much you want them cooked beyond enough to solidify is really up to you. I bake mine about 20-25 minutes. However you may want to check them if you’re going for that long, as the raisins may puff up and burn. Cool in pan for fifteen minutes, then lift out with the parchment and cool in fridge for another fifteen minutes, or long enough to set up the melty chocolate. Then cut fully into bars. These bars are very firm, in fact hard, when fully chilled, so you’ll want to serve them at room temperature. I have no idea how long they keep, because people eat them right up, but I would imagine at least three days air-tight at room temp. *Basic seed mix is sesame, flax, sunflower and pumpkin seeds; it’s my favorite thing ever. You can use whatever mix-ins you want, but I really like the addition of seeds. The basic seed mix and the chewiness of the oats ensures that it takes a while to eat one of these things, giving your body time for the fat and fiber to hit. Even though they’re basically fibrous candy delivery vehicles, it’s hard for me to eat too much of them. That’s good, because eating too much flapjacks is a lot like eating too much baklava- it will make you pretty sick. I made amazing baklava once, in the early ’90s. I couldn’t eat baklava again til the 2010s, and i’m nowhere near making it again yet. If you’ve ever had sugar burn on your tongue, a kind of horrific experience I think mostly bakers testing recipes have, you know what I mean. *Rimmed. That’s what they’re called. Christ, you guys. 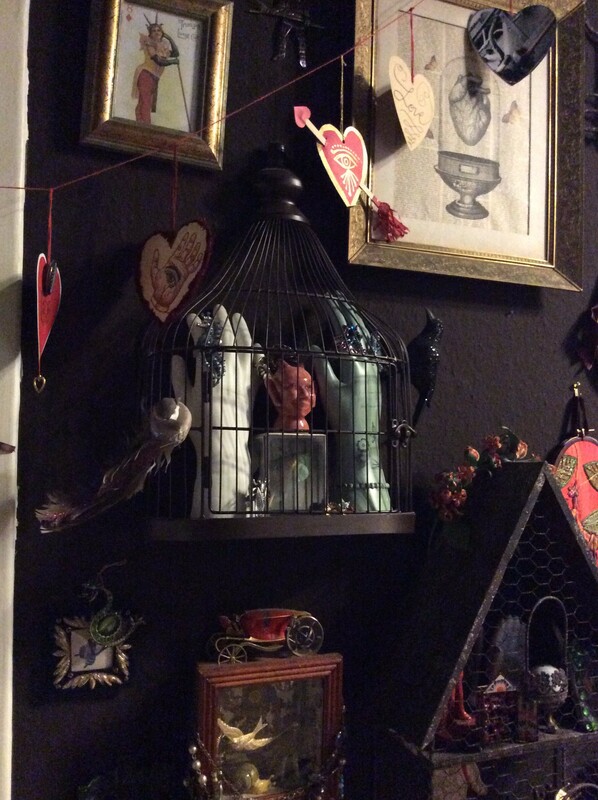 This entry was posted in Baking, Berlin on April 7, 2016 by Suzanne Forbes.